If you've been reading book blogs this week, then you are likely to have seen a least a couple of nonfiction reading lists because (as I mentioned on Monday) Nonfiction November is up and running. Here are just some of the true stories that are awaiting my attention. About this list: I restricted myself to books published this fall and chose only a few titles in three broad categories. In addition I decided to feature books I own. The backlist is brimming over with fabulous nonficiton titles, and I hardly own even a small percentage of the frontlist. 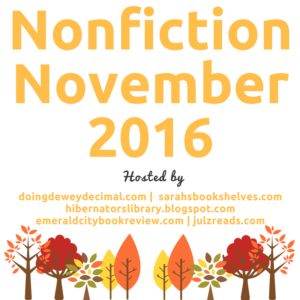 Consider this list a good jumping-off place, and be sure to visit the official Nonfiction November post to learn how you can participate and to discover more recommended nonfiction books. Memoirs come in many forms from inspirational to autobiography to humor. 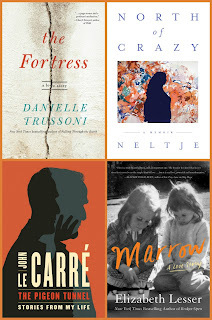 My picks today have a literary foundation and are written by three novelists and the daughter of a publisher. 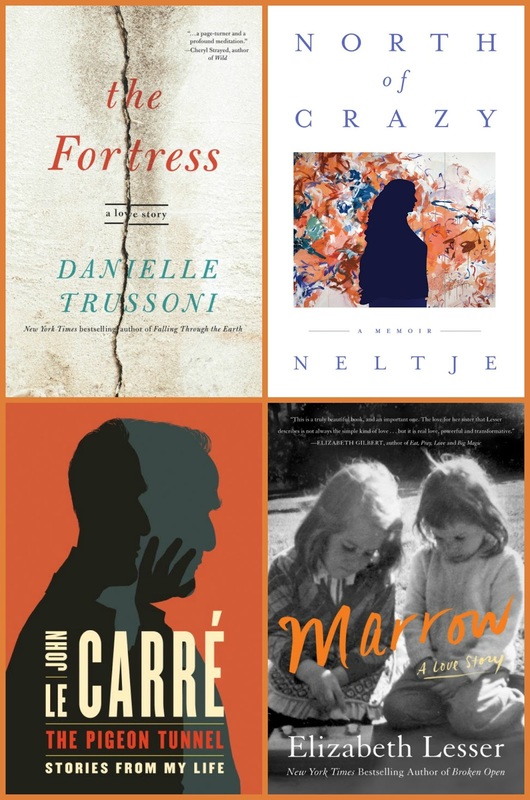 The Fortress by Danielle Trussoni (Dey Street Books): The author of Angelology writes about her ex-marriage to a Bulgarian writer and their isolated life in France that she eventually needed to leave. North of Crazy by Neltje (St. Martin's Press): The daughter of publishing great Nelson Doubleday takes us inside the life of privilege to reveal its less glamorous side and her decision to take a different, independent path. The Pigeon Tunnel by John le Carre (Viking Books): The best-selling author opens up about his work for British intelligence during the cold war, his travels around the world, and the people and events that influenced his work and his life. Marrow by Elizabeth Lesser (Harper Wave): The author of Broken Open talks about her love for her sister, her decision to donate bone marrow to her, and their life together. 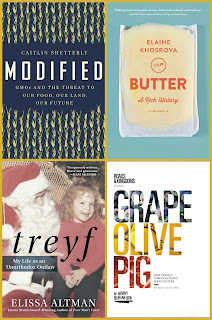 Oh I bet you're really surprised that food writing would appear on my list of recommended nonfiction titles. I had a hard time narrowing down my choices, but here is a mix of science, history, and cultural perspectives. Modified by Caitlin Shetterly (Putnam): When she learned that her son was allergic to genetically modified corn, this journalist set out to investigate the prevalence of GMOs from the cornfield to the food manufactures to the home kitchen. 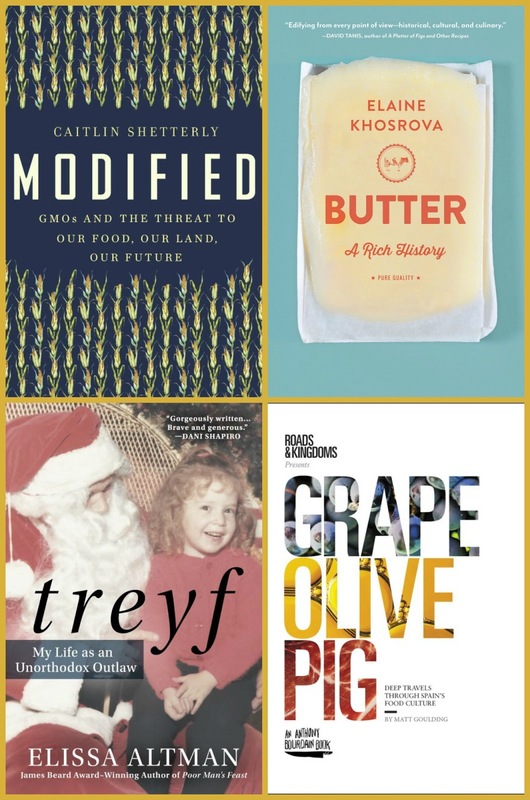 Butter by Elaine Khosrova (Algonquin): The fascinating history of butter from early herders to modern-day artisans, told by an award-winning food writer and pastry chef. Grape Olive Pig by Matt Goulding (Harper Wave): Part travelogue, part culinary guide, part love story to a country, a well-known food writer takes us on an unforgettable journey through Spain, his adoptive home. From a very young age, I've rated biography among my very favorite books. 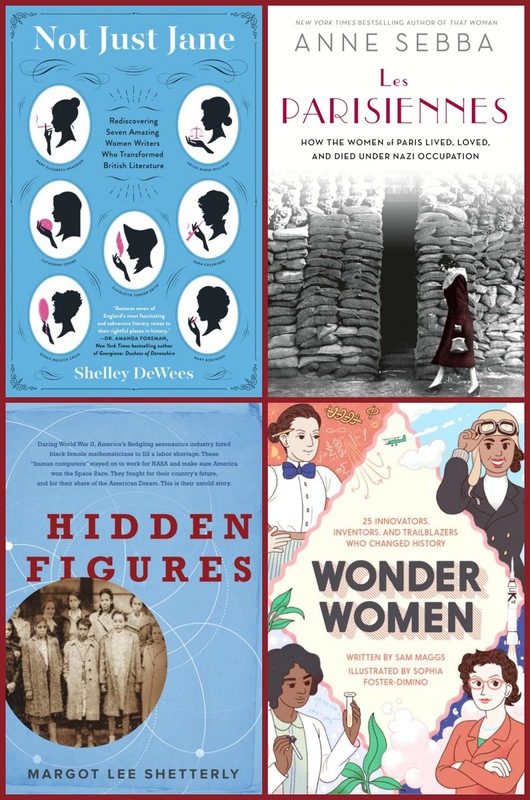 Today I feature books that introduce us to a variety of fascinating women: authors, mathematicians, trailblazers, and ordinary women in extraordinary circumstances. Not Just Jane by Shelley DeWees (Harper Perennial): Meet seven other women--besides Austen and the Bronte sisters--who were writing and publishing books in Brittan from the mid-eighteenth century on. Les Parisiennes by Anne Sebba (St. Martin's Press): A well-researched examination of how the Nazi occupation of Paris affected the lives of the city's women. 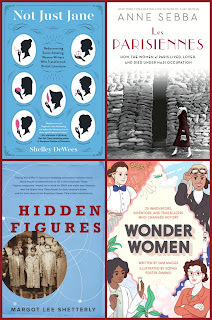 Wonder Women by Sam Maggs (Quirk Books): The stories of twenty-five real-life women heroes, who were "innovators, inventors, and trailblazers who changed history." Awesome list! I have Wonder Women on my bedroom floor and have been seeing Hidden Figures around a bunch. The Pigeon Tunnel and North of Crazy also sound great - adding those two to my tBR!. That's really a great list. I love to read nonfiction, with food history/culture and women's history near the top of my preferences. Thanks! Will add them to the hundreds already on my amazon.com wish list (which in my case is really a convenient way to keep track of books I want to read). I'm pretty picky when it comes to nonfiction, but really want to get onboard with it more. Your list definitely has a few that seem like they'd work for me. I'm especially interested in Les Parisiennes since i generally like WWII books and all things Paris! Thanks for the list! I've got several of those and need to get to them. I love good nonfiction and don't read enough of it. I love non-fiction, especially memoirs and books about food. I'll have to check these out and add some to my tbr list. I love food writing, but haven't read nearly as much this year... and I miss it. Thanks for suggestions! I'm not taking part in this but do like reading non-fiction so I am going to spend a bit of time looking at it on my detail to get on my to read list. Thanks for putting this together. Great list. I had hoped to do Hidden Figures on audio because I heard it was good, but Audible doesn't have it. Interesting how you grouped them by topic. I read a lot of non-fiction and heading off to look at your official November post. I'm reading Butter right now! Great categories! I especially like reading about women in history and of your choices, I've only read Hidden Figure and Wonder Women, so I'm excited to check out the others.